Can You Drift Like These Lamborghini Drivers? - Muscle Cars Zone! Can You Drift Like These Lamborghini Drivers? There are certain types of cars that are specifically made for speed, power and fun. People usually purchase these cars just to test some of these aspects out, even though they might be extremely expensive to buy. Lamborghini is surely the brand that fits in this category, and hereby in this video we take a look at something amazing, something that will blow your mind i.e. skilled Lamborghini drivers pushing the cars to the limit and making some awesome performances. The video kicks off fairly unusual, hence we take a look at a woman who drives the Lamborghini unlike most men will ever be capable off. She leaves from the dealership with another man sitting next to her, and this is where the fun part begins. She drifts, drags and performs donuts around other Lamborghinis without any problem. Even though the parking lot was tight and there was a big risk of damaging other extremely expensive cars, the woman handled every situation with ease. Next on, we take a look at yet another of these awesome Lamborghini drivers and how he handles the snow. The driver takes his Lamborghini for a fun ride in the snow; moreover, this is one of the best paint jobs we have seen being done on such car. But the fun does not stop here i.e. 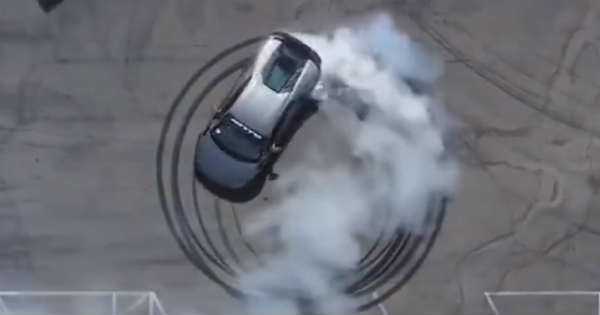 there is yet another black Lamborghini that performs amazing donuts just besides the beach. If you want to see some more fun and see how a skilled driver looks like, check out the full video! And if you don’t own a Lambo, but want to drift one, click here!